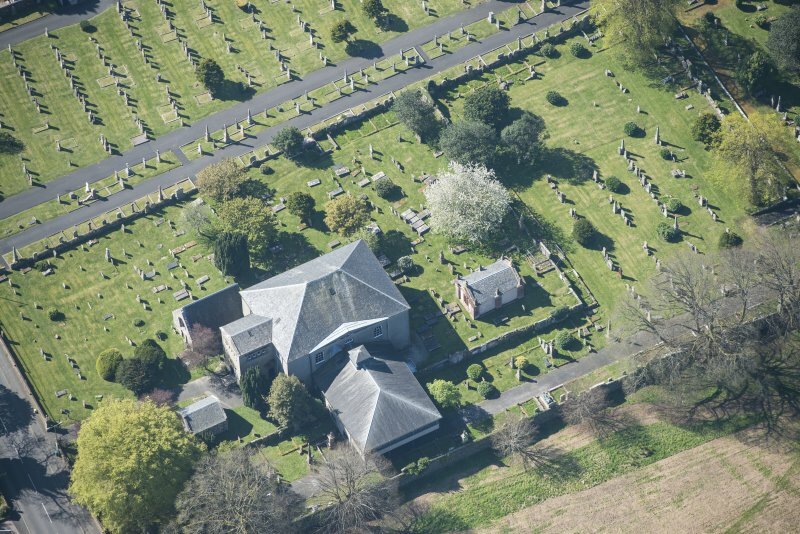 General view from churchyard to north east. Late C18th. 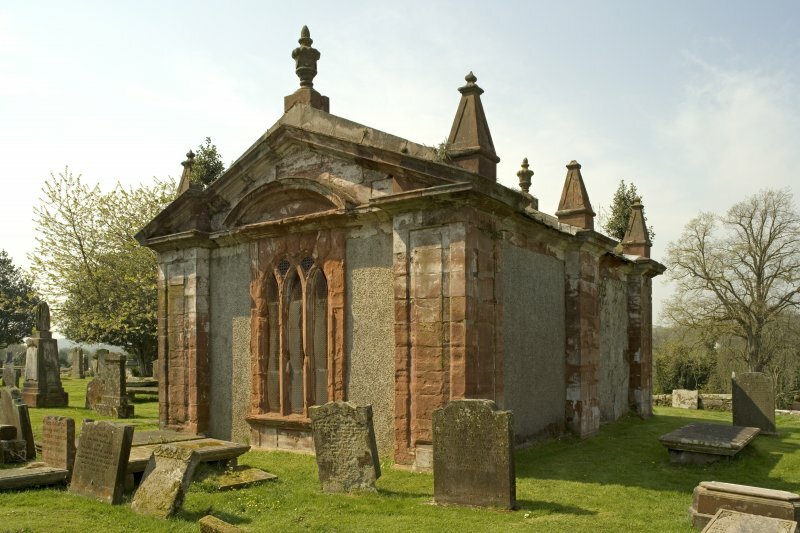 Single storey rectangular pedimented mausoleum. NS 0844 637 (centred on). 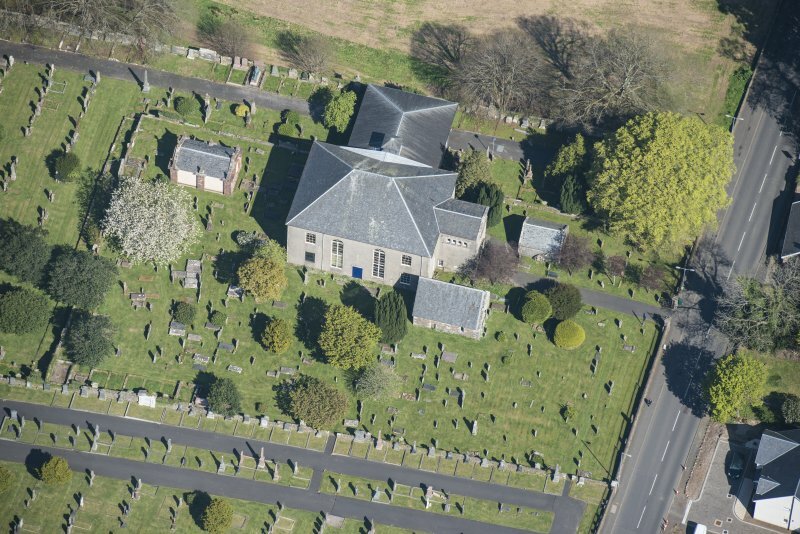 A watching brief was undertaken during the proposed converstion of sections of an 11kv electrical distribution system on the Isle of Bute from an overhead line to an underground cable. The area of investigation was situated in the Kirk Dam, on component of a Scheduled Ancient Monument known as Thom's Water Cuts, aqueduct and dam, Little Barone to Kirk Dam which stretches east/west from NS 08363 6406 to NS 08457 6380, a total distance of some 1200m. Scotia Archaeology, 22 August 2006. 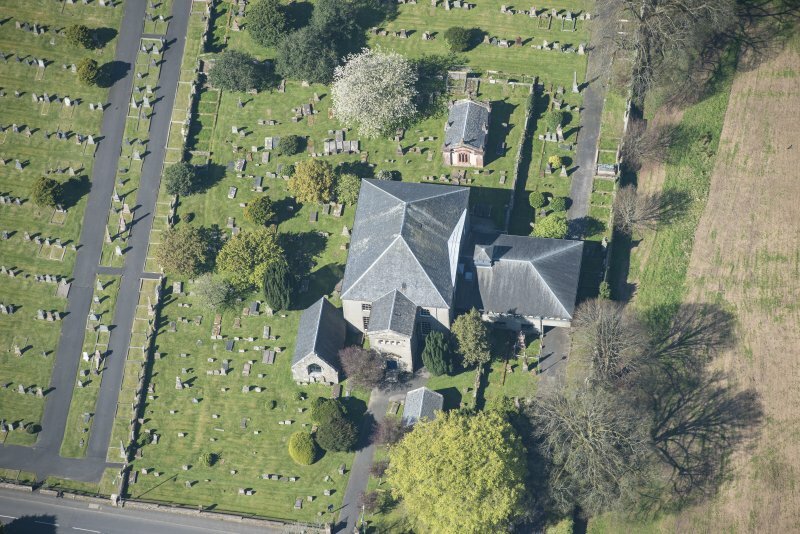 Photographed by the Listed Buildings Area Survey, Argyll update programme. This site falls within the Townhead Area of Townscape Character which was defined as part of the Rothesay Urban Survey Project, 2010. The text below relates to the whole area. 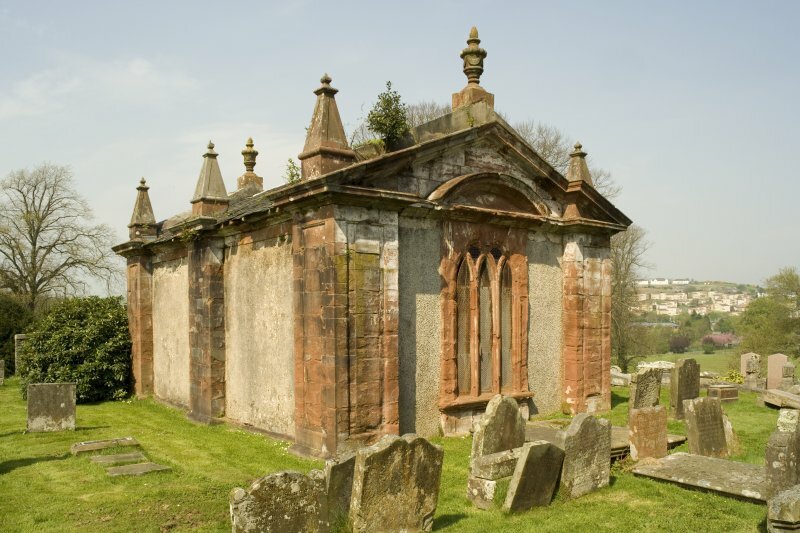 The earliest origins of the Townhead area of Rothesay lie within St Mary’s Chapel, which dates largely from the 16th century but has some remnants of a 13th century structure. 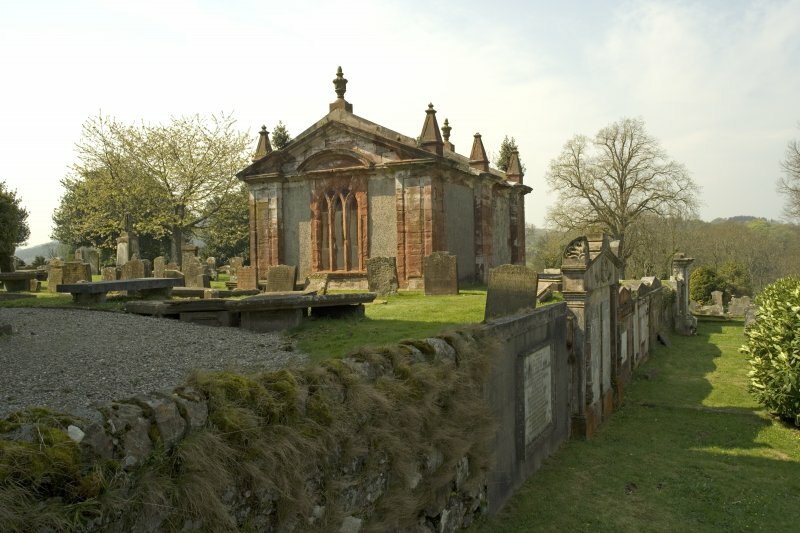 This site has been used for religious purposes from an early date, with the burgh’s original parish church standing on the site now occupied by the High Kirk which was built in 1796 by architect Robertson Buchanan and restored and remodelled internally 1905-7 by Honeyman, Keppie & Mackintosh, and John Russell Thomson respectively. 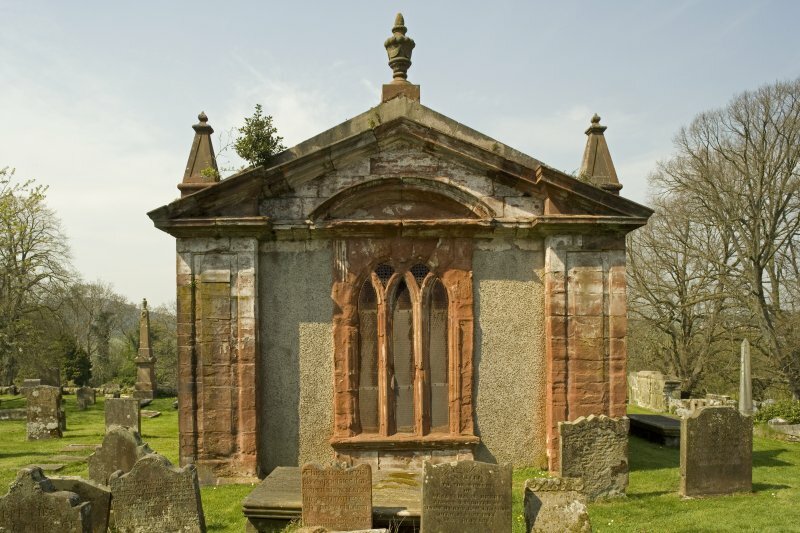 Alongside the Church is the Bute Mausoleum which also dates from the late 18th century as a resting place for the Marquesses of Bute. This slightly elevated, flat area on the southern outskirts of Rothesay encompasses the southern end of the High Street, originally the main thoroughfare for the historic Royal Burgh, providing the link between the 13th century castle at the northern end and the original contemporary parish church in the south. A small cluster of houses built up around the church from the mid-19th century, but the area is mostly open space, comprising functional aspects of the town – hospital, factory buildings, swimming pool, other recreation grounds including the historic Meadows area of the town, and campus comprising primary and secondary schools. The earliest of these, the Robertson Stewart Hospital, now Victoria Hospital Annexe, was built in 1873 to designs by architect Mathew Hunter. This was built as an infectious diseases hospital on a site well away from the main population centre of the town where fresh air was seen as part of the cure. The nearby Victoria Hospital was designed by John Russell Thomson and built in 1897 with a maternity wing added in 1937-8 designed by R J Walker, Hardy & Smith. Professor William James Smith designed the Thomson Home to the north of Victoria Hospital Annexe which was built between 1921 and 1930. Overall, there has been little or no development of plots in Townhead Area of Townscape Character, with no garden ground being given up for new housing as seen elsewhere in the town. Most of the development in the area appears to have happened in an ad hoc manner, with no major planned developments. All new development has taken place on the edge of the area where land is more readily available, from the Victorian hospital to the 21st century school campus (JM Architects, 2007). The focus of Rothesay’s development in the 19th century became the shore/coast with the reclamation of land for new main streets near the harbour, and the rise in tourism. This meant the original High Street became a subsidiary street with the main development and expansion of the town being east-west along the coast rather than inland north-south along the former main street of the historic burgh. However, the High Street remains as an important arterial route into the town from its hinterland. This is the only main road in Townhead, apart from a service road to Victoria Hospital Annexe (Mathew Hunter, 1873) and Thomson Home old people’s home (Professor William James Smith, 1921-30). 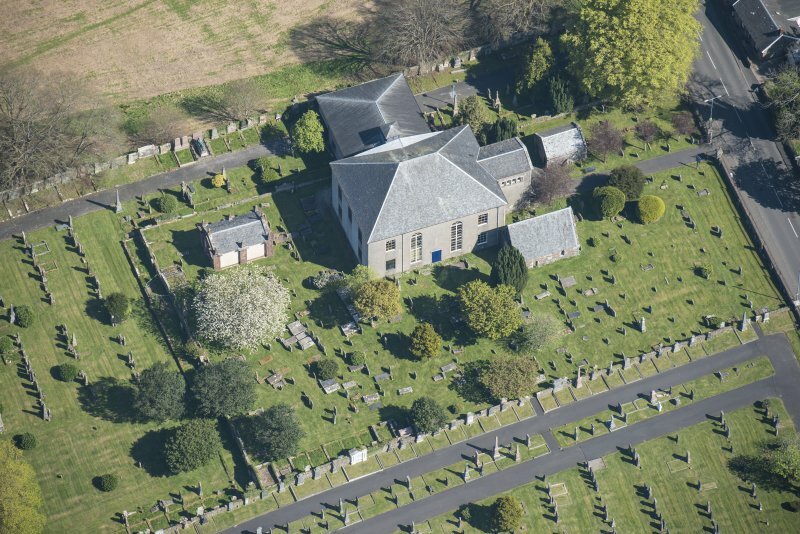 The remains of 16th century St Mary’s Chapel and the subsequent High Kirk (Robertson Buchanan, 1796) are the earliest buildings in the area, with the majority of other buildings in the area dating from the mid-19th century onwards. These are generally single-storeyed with attic, plain stone cottages (some whitewashed), though there are two- and three-storeyed tenements on the eastern side of the High Street in the far north of the area as it approaches the Industrial Rothesay Area of Townscape Character and Town Centre Area of Townscape Character. 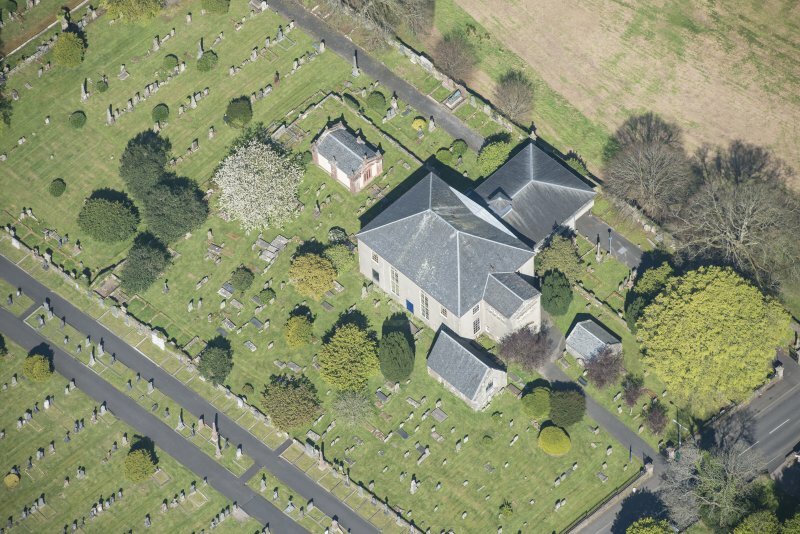 As a result, the southern section of the area around the church has the feel of a village rather than a suburb of a town. The Townhead area is the focus for much of Rothesay’s health facilities, with the Victorian and post-World War I hospital facilities establishing themselves here. In the later 20th century, leisure pursuits have expanded on the historic Meadows function, with the town’s leisure pool being built on the High Street in the 1980s opposite Eden Drive. The island’s education facilities are now concentrated here with the building in 2007 of a campus designed by JM Architects, containing primary, secondary and tertiary education on the southern edge of Rothesay. This two-storeyed complex consists of white-rendered teaching and blue brick communal accommodation blocks with shallow-pitched roofs and was built on the site of the original 1976 primary school for the town. This more rural feel eases the transition from the compact town centre to the surrounding countryside of the island, despite the large scale developments of the hospital/health centre and the school campus.